Mum made it home from work and will have to work all day Monday. So not much of a holiday here. So we played for a while and she gave me some treats. She redided the play cubes again. I think to keep me guessing which way to make it through. If she gotted more I could have a big maze to play in. For this past year I am thankful for getting 'dopted into a wonderful home. 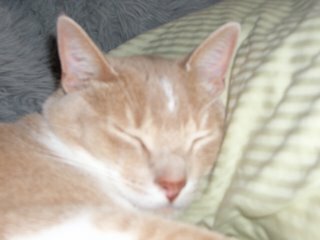 I am safe and well cared for and that is all that us kitties could ask for. 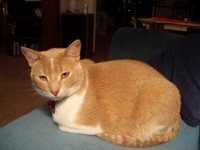 I am also thankful for my new blogging friends, it helps to know what other kitties are doing and how your mum's and dad's help you out. We will have a good dinner tonight, mum is going to be cooking a turkey breast. So I will get to smell how wonderful turkey is when it is cooking. Plus that means good things for me to eat. Have a great time celebrating. Be safe tonight when you travel about. Catch up with you all next year. Hoo, hum. Mum is very tired as work is very busy. Being the end of the year she hadded lot to do and even has to work part of the weekend. Bummer for her. Guess I better go and get my cuddles, snuggles, scritches and treats. Just give her some extra lovin' in return. We made it through HP #2 yesterday night. Tonight mum wants to go through the other special disk with all of the extras tonight on the 'puter. No I don't like popcorn, although I don't mind the butter, if mum adds it. Don't care for goldfish like Oreo either. I do like a small bits of potato chips. We watch from the couch, the bedroom does not have the DVD player. 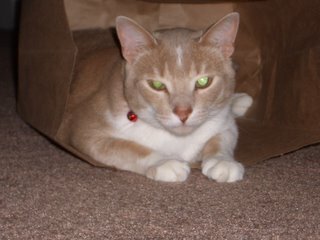 But we snuggled and I gotted some of my own treats, tuna Pounce and chicken Deli Slices. Ohh, and just before we started the movie I was running around like crazy and calling mum to the big floor windows. The cat that tried to jump up on our outside windows back on November 20th was back. The kitty was slowly stalking through the snow in the back and coming up onto the patio. When he saw me he tooked off. Mum got a better look at him and says he lives behind us. They let their kitties out to wander even in the cold. Mum says she would like the 'puter now. Guess I better let her have it. Later gang. Mum says we are gonna watch one of her purresents tonight. She gotted two of the Harry Potter movies for Christmas. Now she has all three that are on DVD's. We coulda have our own HP film festival here. Gotta go, mum is ready with the movie and popcorn. Mum and me learned a new word today "pucha". This means cat in Malayalam, which is a language spoken in India. That is a far away place where Mary-Susan is from. She is married to my mum's nephew Josh. They have a kitty named Claire. Also mum found a funny show on the TV. It is called Creature Comforts. It is on BBC America if you get this on your cable hookup. Mum laughed lots when she watched the other night. But since it is British made you may or may not get the humor.... or is it humour?! Well, mum hadded to back to work today. Not like some who get lots of time off at this time of the year. So I was very happy when she came home and got my daily share of scritches. The gang at Crew's View gotted cat cubes for Christmas too. But Max and George are upset that the color is PINK. 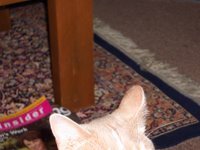 They are boy cats but do have a little sister Tipper who is very happy with the pink color. Plus I had a couple of questions on my glass hologram thingy with my face in it. Well, it sure looks like me, but no I did not pose directly for it. Mum looked through the paperwork that came with it. First it was bought at "Old World Christmas" a special event/sales in Elkhart Lake, WI early this month. The people who sell them call them laser crystals. No website but here is the name of the vendor. Says they have all sort of stuff, animals, sports, holidays, birdies, fishies and lots more. Not sure what exactly Boxing Day is, I don't think it has anything to do with guys (or gals) hitting each other. Maybe it has to do with putting boxes away, which is what mum did today. She putted some of the extra Christmas stuff away, and she wented to the decoration store and boughted stuff for next year. Says she gotted a really good deal on stuff to put up outside the house. Mum also redid the cat cubes and made them take up less of the middle of the room. So I had fun running in and out of them while she was trying to hook them together. I love it when mum just lays on the floor and plays with me. Sometimes I think she is a another kitty and want to wrestle with her like another cat, but then she thinks that is too rough for her since I want to bite sometimes. 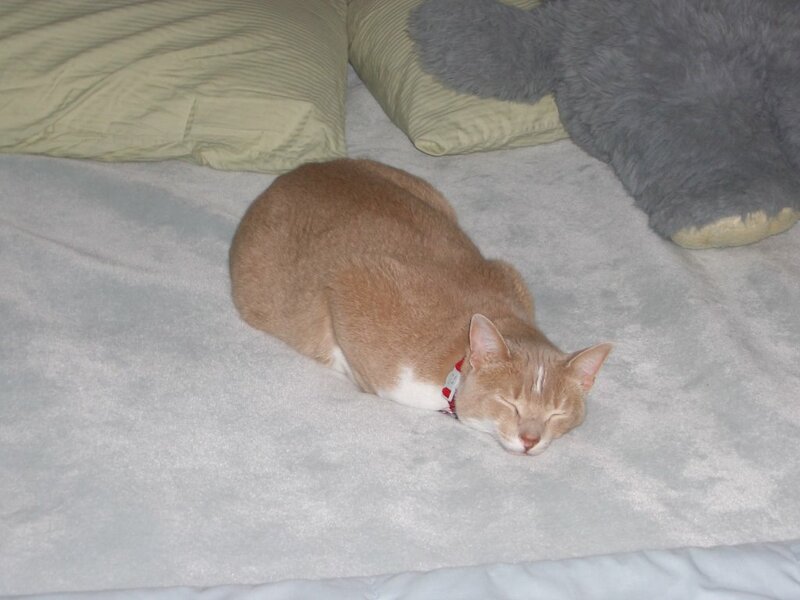 Mum washed all of the blankies on the bed, so everything smelled so wonderful. 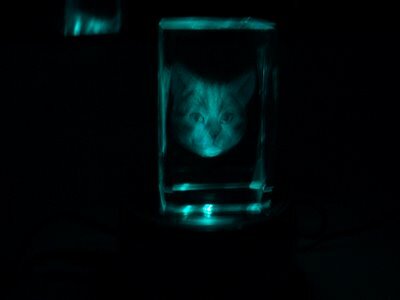 And she moved her hologram thingy out in the living room where we can see it. I sure do like seeing my face in this glass thingy. Well the day is beginning to wind down. Mum is home to stay for the evening and turned on the 'puter so we can catch up with all of our fellow felines. Hope that all had wonderful Christmas celebrations. 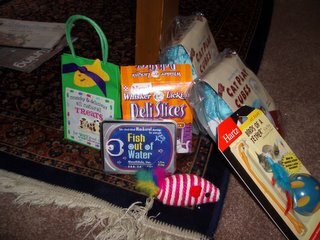 Well after church today mum and Grampie came over and we opened our purresents. Everybody gotted good stuff that they liked. You can see my stash, mum didded a good jog picking this stuff out. 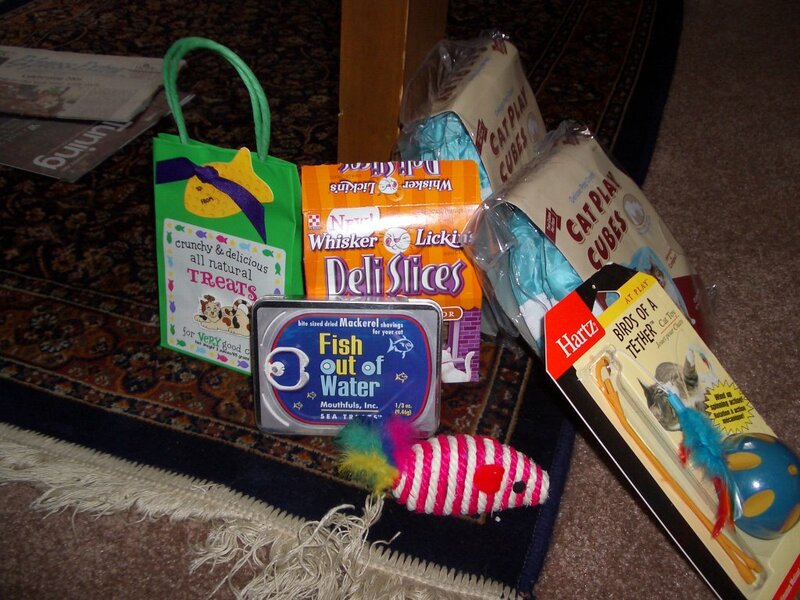 Then I helped mum to open some of her purresents as well. But she made me give the shiny green stuff to her. Said she didn't want me to eat it and get sicked on Christmas day. But lefted the papers out for me to play with. Then Mum and Grampie had lunch. Mum gave me a bit of the ham and for dessert I gotted to have peppermint ice creams juice. Yummy stuff. Even Grampie was impressed with the ice cream too. 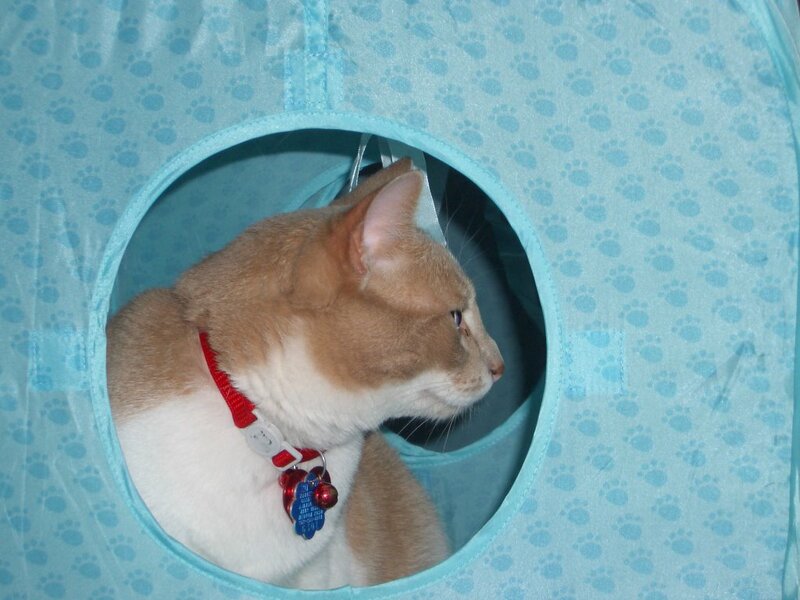 Then mum set up my tunnel cubes. Grampie gotted a good laugh from them and how much room they take up. But mum says she can take them down when needed. I remember seeing something like this on someone elses blog, but now we can't find it again. So I think this is neat and thanks 'cuz this was a good idea for me to play with. I like travelling in them from one end to another. Then I was tired so I had a long nap and mum and Grampie wented to have dinner at his place and have his chef do the cooking. Mum was not going to fix a big fancy meal for just two people. Where Grampie lived they hadded fancy salads and grilled steaks. No way was mum going to cook like this today. Ohh, Ohh, and I finally figured out what to get mum. 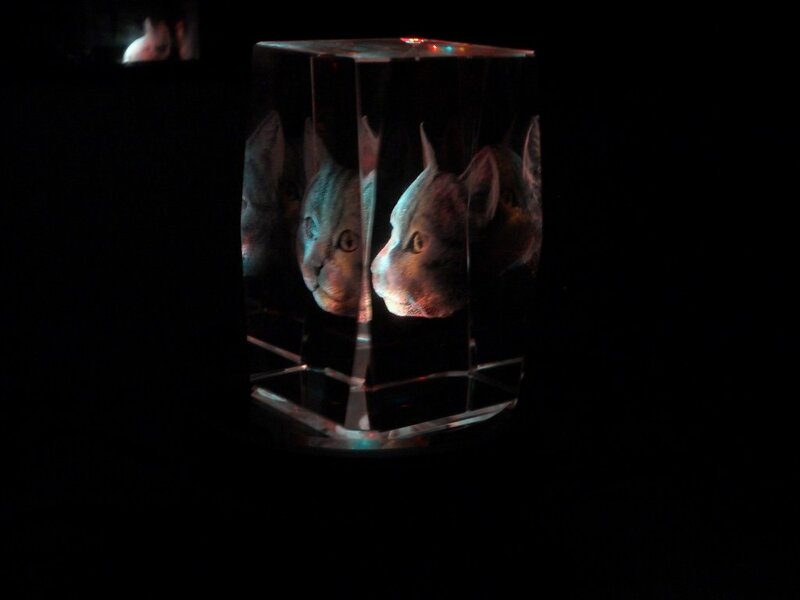 I had a quick word with Grampie and he let me give mum this absolutely stunning cat glass hologram. The image is somehow inside a square of glass. It sits on a thingy that has colored lights and rotates. 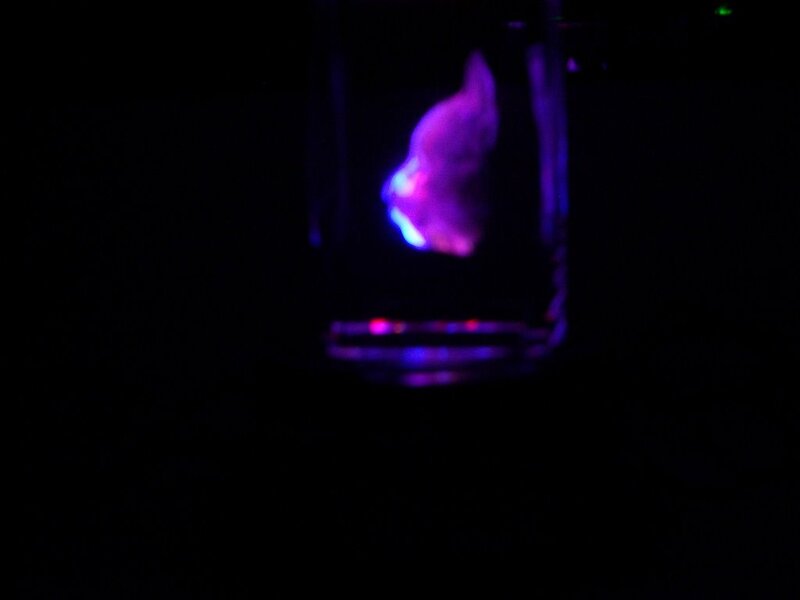 It looks so cool in the dark. Mum gotted only one really sharp picture and never one with the colored lights. For all of you the story of the first Christmas Day. The true reason mum, Grampie and me celebrate this time of year. And it came to pass, as the angels were gone away from them into heaven, the shepherds said one to another, Let us now go even unto Bethlehem, and see this thing which is come to pass, which the Lord hath made known unto us. And they came with haste, and found Mary and Joseph, and the babe lying in a manger. And when they had seen it, they made known abroad the saying which was told them concerning this child. And all they that heard it wondered at those things which were told them by the shepherds. But Mary kept all these things, and pondered them in her heart. And the shepherds returned, glorifying and praising God for all the things that they had heard and seen, as it was told unto them. Merry Christmas, God Bless You All. 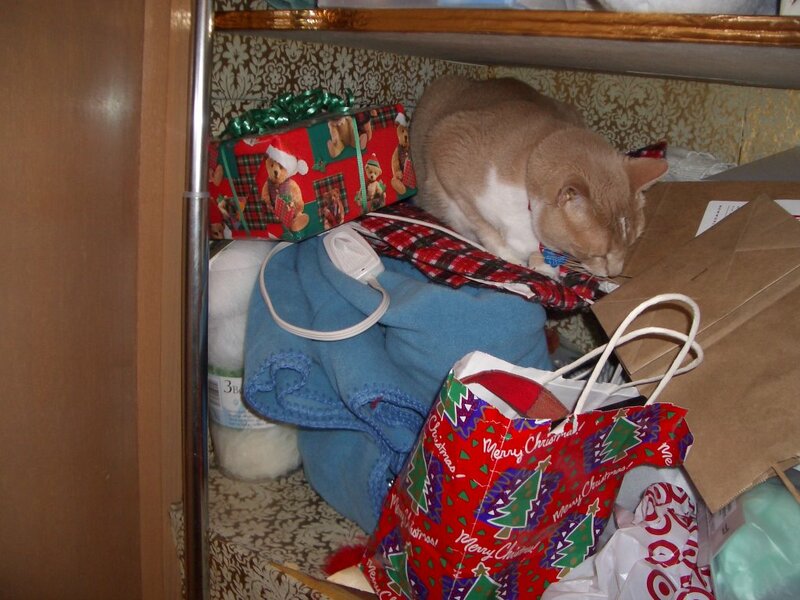 I gotted into the closet with all of the stash of purresents. However I didn't get a chance to see exactly which ones are mine. I hope all of them. It has been a nice day home with mum. She made sure all the outside birdies has their food so they have a full tummy for Christmas. It was all sunny and warmer. Warm enough to melt some of that old yucky snow stuff outside. Mum even wented and got the car washed so it looks nice for Christmas. 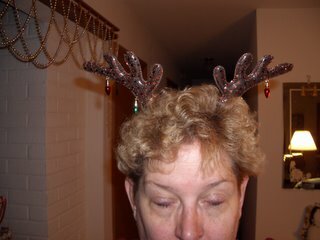 Lastly a picture of mum with her "antlers". She broughted them home from work. Last week she gotted to play one of the reindeers. She said they made her be "Vixen" but she isn't really a vixen at all. Mum says just a few more days 'til Christmas. I still don't know what to get her. William suggested using plastic online. I am not sure about that. Will they really let me trade my plastic jingle balls for something for mum? That would be wonderful. I gotted at least 6 or 7 balls I could trade in. That would get her a really fancy purresent. And mum gotted home a little early from work today and she says she doesn't have to go back to work until after Christmas. So lots of play time for us. Ohhh, mum says she still has some things to get done before Christmas, so she can't play ALL day. But yes we will have extra play time. Our heart go out to the Cowboy on his loss of his little Monster Eponine. The cowboy wonders what we kitties think when we see our humums naked. Well, I try to keep a straight face myself. Take care Cowboy, I'll keep checking in on your progress. It has been a nice quiet evening. 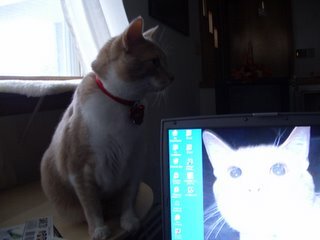 I have had time to catch up with all of my fellow blogging felines. 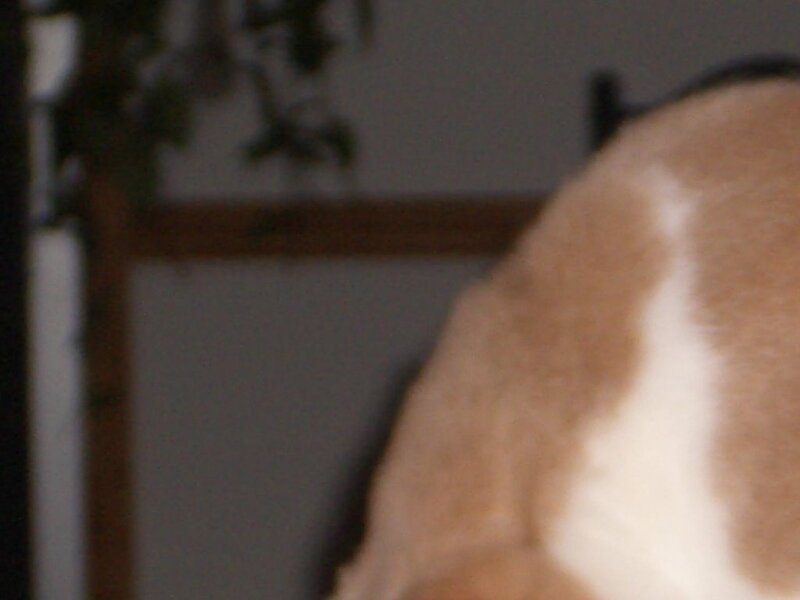 One special kitty is Eponine. She and the Cowboy needs our purrayers and support. Mum has gotted all sniffley reading about her and all of the comments on her blog. Let's all put our paws together, bow our heads and say a purrayer for Eponine and the Cowboy. Mum could leave me have the 'puter tonight. She finished her big project at work today. So I don't have to sit here and watch her work. She is tired as she stayed up past her usual bedtime for a good number of nights. She even turned off the Packer game last night. She said the game was so bad it wasn't worth watching. Mum gotted a Christmas card today with a comment that my picture se sent out was "adorable". Yes I am if I can be so humble. Also this same lady has a bunny that lives with them. 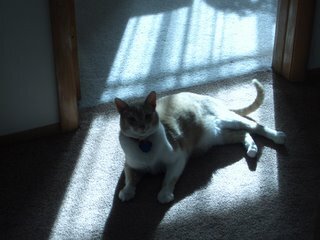 George, at Crew's Views, gotted in trouble for bending the blinds to look out the window and get at the heaty spot. I don't have any of those blind things at my house. 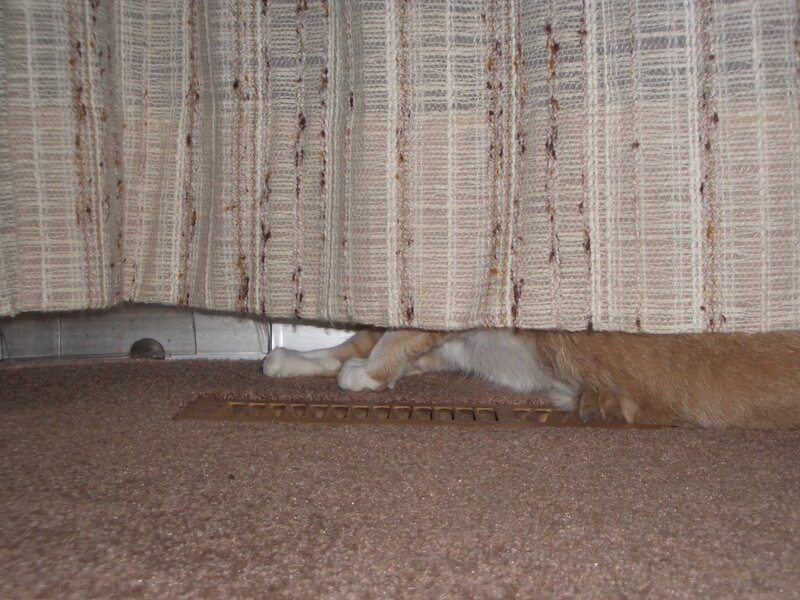 But I can hide behind the big long curtins, watch outside AND sit on the heaty spot all at the same time. Plus mum is telling me to repost some pictures from the other day as they were so dark. She made them easier to see by majic with the 'puter. I was complaining the these little creatures are taking over my spaces to sit here in the house. 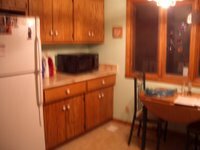 Its my house. Give me my room. Oh, mum is yawning, so am I. Time to turn off the 'puter. Time to go and snuggle in bed. 'Night. Mum says I gotta do my post quick. Seems she still has this big project to do on her work 'puter. Mum says thanks for the nice words on her pictures. She looked at them at work on her big screen and thoughted some of them were a bit dark. But they looked OK on her laptop here when I posted. Yes, I am collared again. Once mum found it I knew I would have to wear it. Although the jingles go with the season right now. Miss Kitty wanted to know what I was getting mum for Christmas. Well, I have no money, no way to get to a store, wrap it etc. Guess I will have to think of something that I don't have to buy. Hmmmm. Ohhh, mum is done making her dinner and I smell turkey. I better go get some. Mummy took some nice pictures the past few days. She gotted them transfered over to the 'puter so I can post them. Firsted the moon hadn't quite set yesterday morning and you could see it through the crapapple tree. 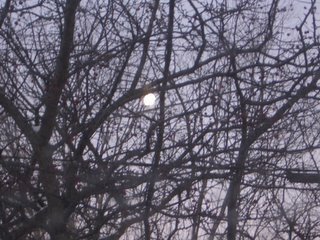 If it is dark enough the moonlight comes in the window and lights up mum's sleepy place. This picture is wider view but you can still see Mr. 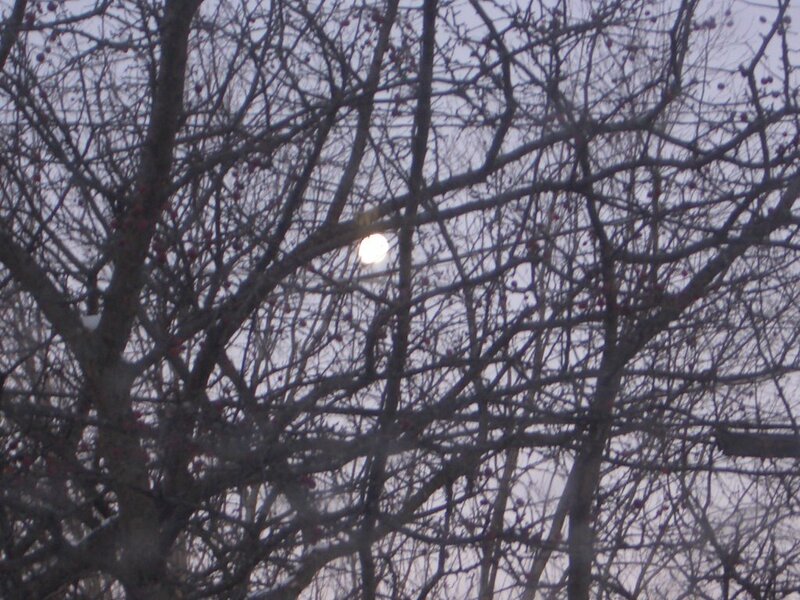 Moon in the tree branches. 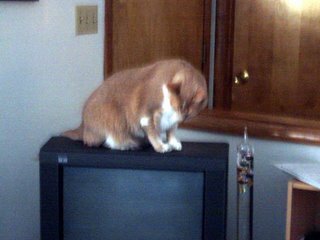 Then I decided I needed a nice place to sit and decided the top of the TV would be the best place. So I had to move a few of the little white people off to make room for me. I'm sorry but I need my space and this whole house is my space. I share it only under duress and I have first dibs on where to sit. 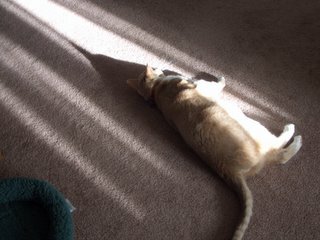 Today was a wonderful sunny Sunday and I took advantage of resting in the bright light and warming my fur. First one side in the living room and then the other in the hall. 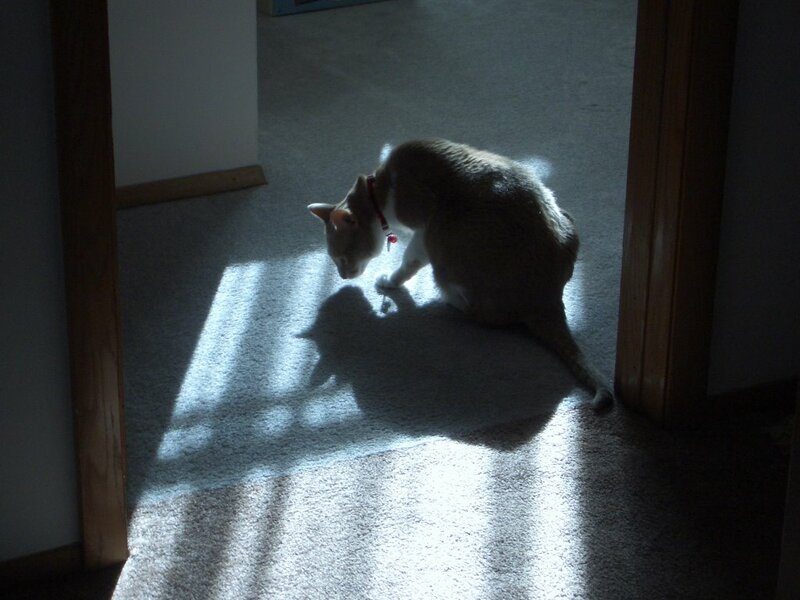 What a nice shadow kitty I have that travels with me. Opus and Roscoe, sorry but the Colts losted today. They didn't have the game on our TV today, they hadded the purple people playing. But mum is happy as the purple people lost. Hee, hee, hee. Oh, and mum boughted some turkey for me at the store today. So I gotted a special treat today to eat. YUMMY. Mum is letting me blog while she works on her hurted finger. She was making her very last batch of peanut brittle and caught some of the very hot stuff on her finger. She is cooling it down with water and a "cold beverage". She says she will be fine. Grampie came over today for a while this morning. He had a fancy box which he gave to mum and she putted it away in the closet where all of the other purresents and stuff has been put. Mum didn't say if it was for me. I hope so. 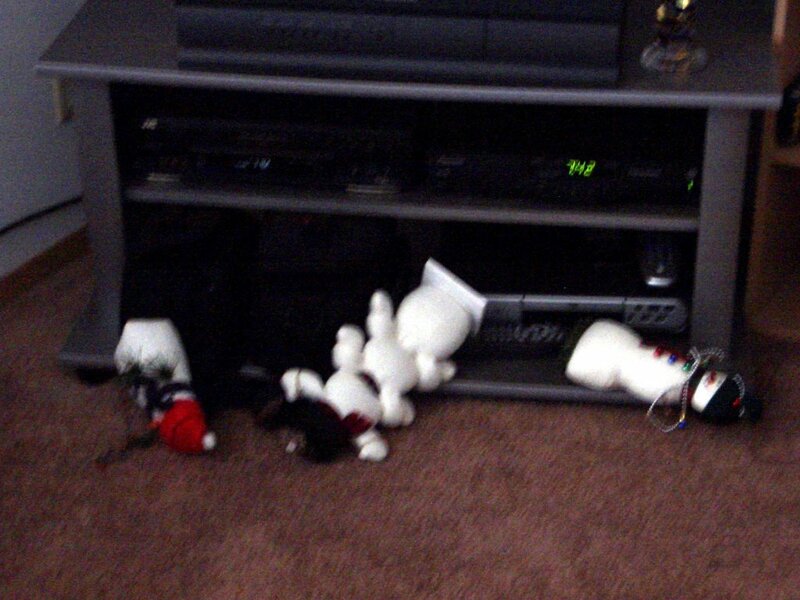 The they putted a new shelf in her entertainment center. The did lots of nailing with a big hammer. 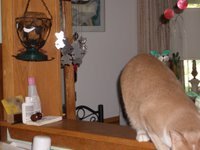 I wanted to watch but mum and Grampie kepted me away so I didn't get my nose bonked. Mummy didn't let me blog last night, I gotted carried away and started to play a little hard with her. I was using my teeth a bit more than she would have liked so I gotted a time out and no blog time. Bummer. Plus I have to finish this so she can work on her work computer to finish a project. I am not allowed to use her work 'puter. Oh, her she comes. She says her finger is fine and feels much better. But now she needs to work. Guess I will go hang out and dream by the tree for a while. Nice kitty, Santa Claws bring me lots of purresents. Nice kitty, Santa Claws bring me lots of purresents. 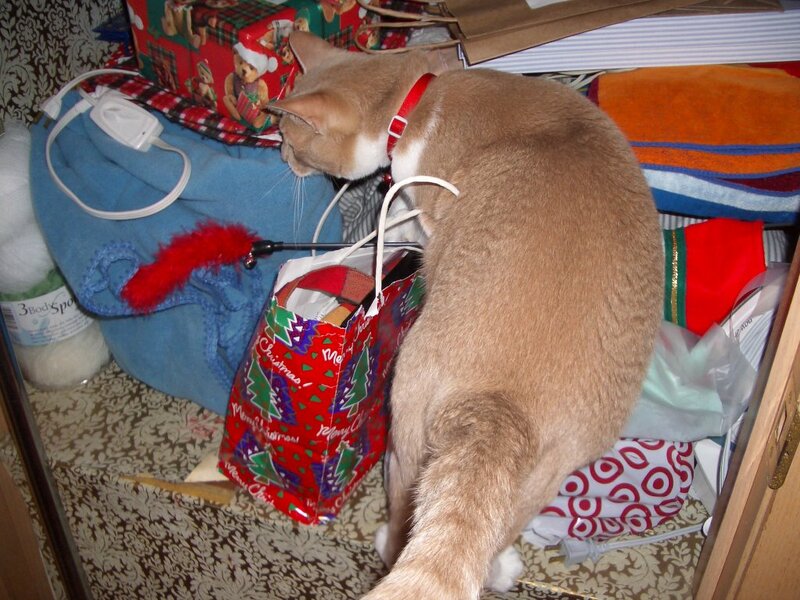 Nice kitty, Santa Claws bring me lots of purresents. 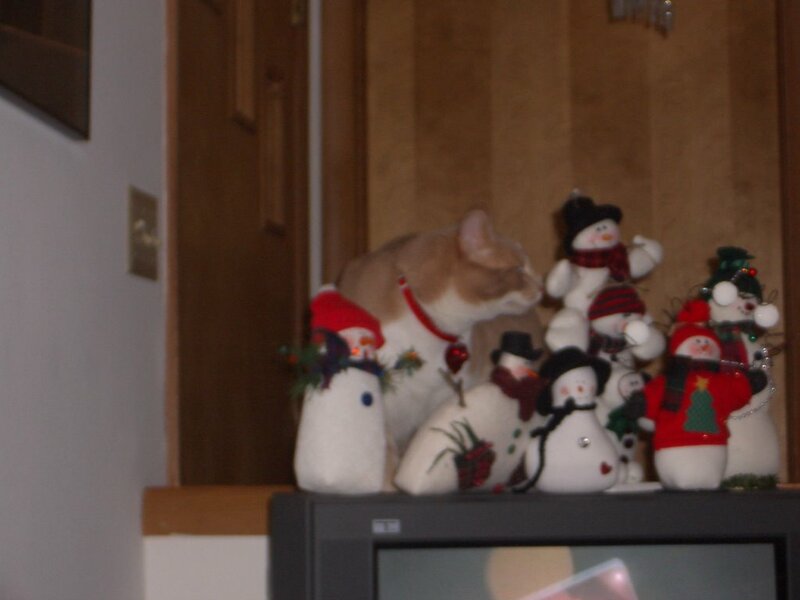 Nice kitty, Santa Claws bring me lots of purresents. 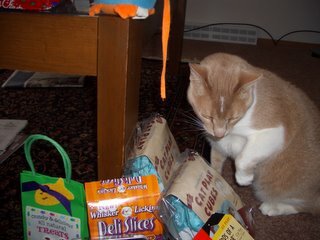 Nice kitty, Santa Claws bring me lots of purresents. . . . . . Z Z Z Z Z Z Z Z Z.
Mummy won a prize today at work for her peanut brittle. They hadded a lunch for the holidays and everybody makes food. Mum won for best dessert, second year in a row. I hope I can help her spend her prize. Tonight she stepped on one of my jingle balls and broked it. Hey lady be more careful where you are putting your big feet. SNOW, SNOW, SNOW! Mum gotted her big machine out that moves snow. She made fast work of those little white flakes. It has gotted warmer here, but not real warm. 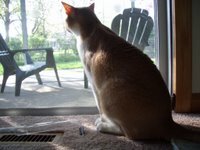 I just stay inside watching the birdies and such play outside. Hope they stay warm. Look at these words and what they mean. Why do they blame everything on us cats? I have never heard dog-tastrophe or a dog-aclysm. Not fair! Ohh, mum has left the 'puter alone for a while. She is in the kitchen cleaning up. We had left over Chinese tonight. So I got little pieces of chicken and shrimps again. Plus she was a very good helper and gotted out all of my pictures for Christmas sent out with the cards. I know the extended family will just love seeing me. Mum called me her " snuggle partner". Yes, we do snuggle good together. 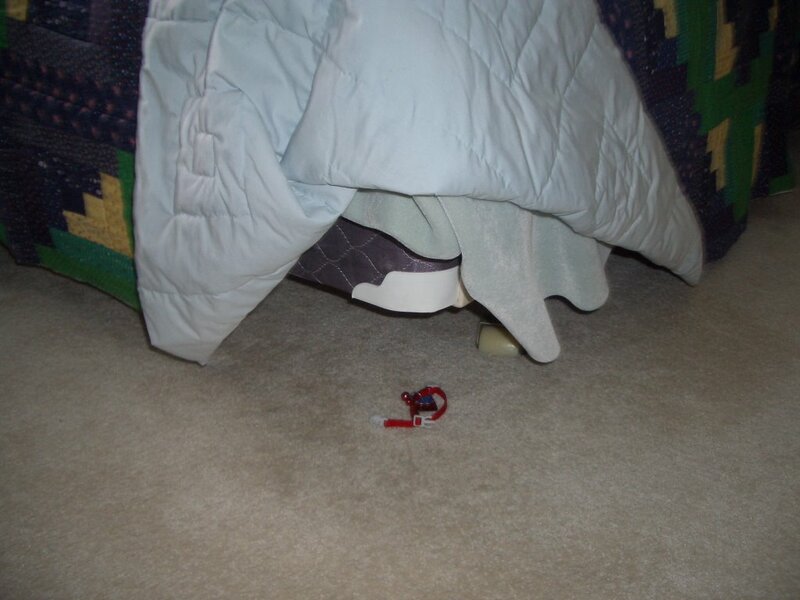 William suggested that I hid my collar farther under the bed. Well, she had looked under the bed, but it was by the edge and hidden by the blankie. If I could get it in the trash then I know I wouldn't see it again. Yes, the blankie is a very nice napping blanket and mum's sleepy place is a good place for me to get my sleeps too. Plus there are a whole bunch of these little white people around the house. The house is getting crowded with all of this new stuff mum keeps bring up from the dungeon. And lastly, there is joy in Packerland, they managed to win a game last night. Mum hollared very loud when they won. I had to jump on the bed to make sure she was OK she made so much noise. I gotted a big hug for that. Wish they would win more often if I get hugs. AHHHH. I knew it, once mum got out the big sucking machine she would find the collar and she did. 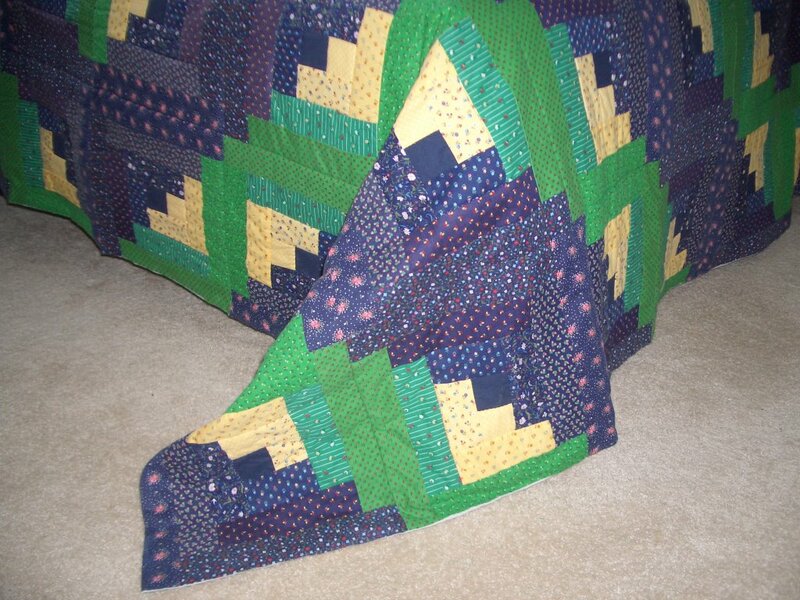 It was hidden, my friends, under the extra folds of her pretty bed blanket. You can see me on top of the bed to stay out of the way of that sucking machine and that the blanket goes all the way to the floor with lots of extra length. 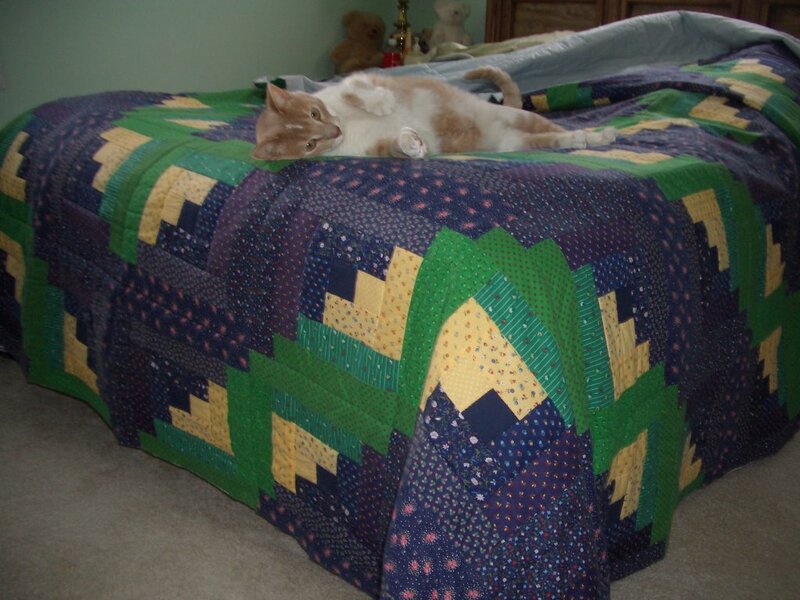 So that the blanket doen't get caught in the machine, she folds the extra back up on the bed and............BUSTED. 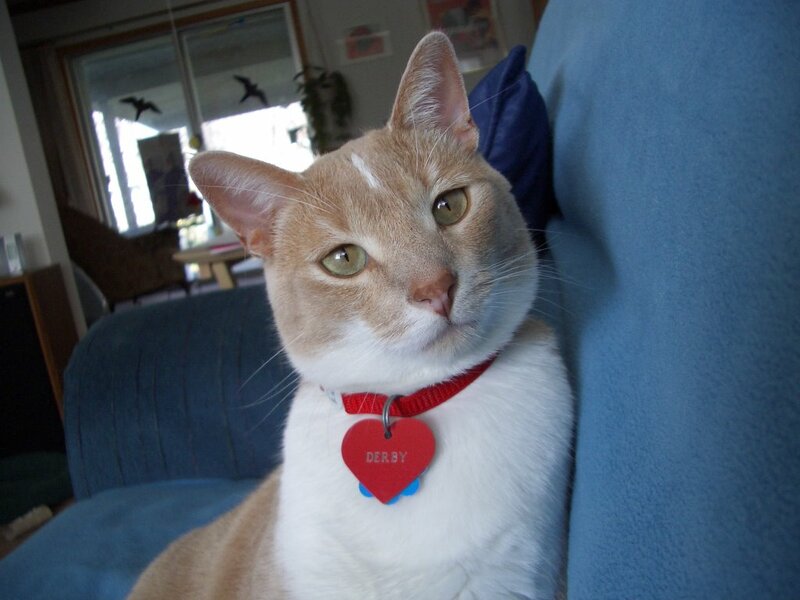 So I've got my collar back and will need to find a new place to hide it the next time. 'Cuz I know she will look around the bed and blankies real good from now on when I lose it. Bummer, now I can't sneak up on her. 18 birdies at our feeders all at one time. Wow. Lots to look at. Mummy had to count them as I ran out of paws. We hadded mourning doves, juncos, chickadees, sparrows, house finches and gold finches. Mum has been home almost all day, unusual for a Saturday. She left for a very little while and got rid of the big box she brought home. Said it had to get sent to Uncle Stormie. Also another package for Uncle Flip. 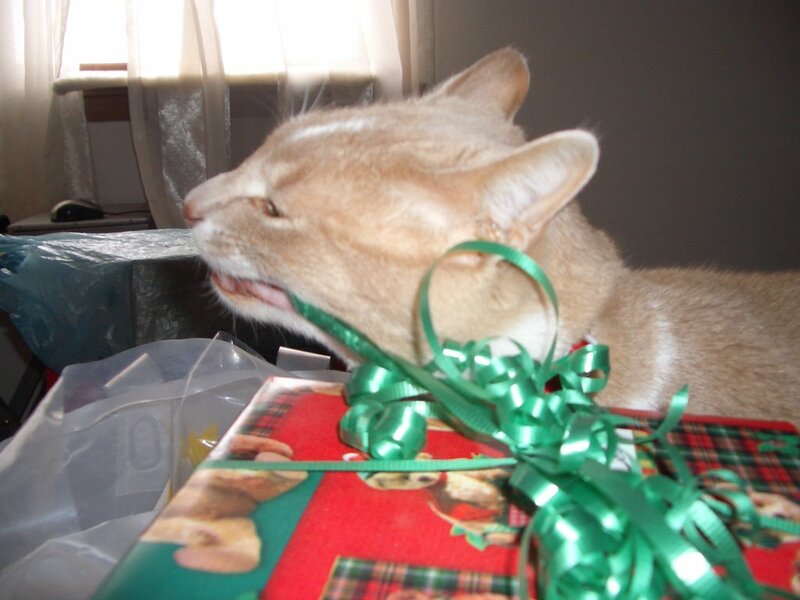 Make sure they get their purresents for Christmas in time. Then mum wented and worked in the dungeon again, keeping me out. She said she was working with putting her tongues oil on wood. That sounds yucky and she wanted me out so I didn't get it on my paws. Yes, I lick myself, but I don't like a piece of wood. 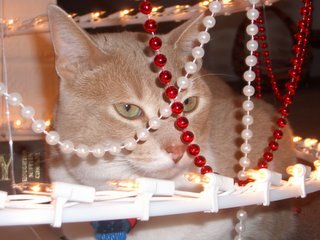 Then she restrung all of the beads on the tree, they didn't look very good since I had knocked over the tree a few times. 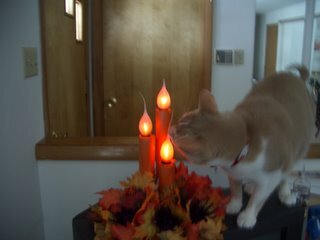 It looks much better now and I tried, but didn't knock it over. Plus mum was making more peanut brittle, says she needs it for a party at work and for grampie. Now quiet time with wonderful Christmas music, me napping and mum reading her book. But mum, didn't you say you were going to work on getting all of the Christmas cards done. So you can send pictures of me? I hate to be a nag about this, but the family needs to see me. Mummy brought home what she calls Chinese food. I gotted samples of chicken, shrimp and some crab/cheese stuff. Yum. The I wented and sat on the heaty spot to keep my tummy warm. 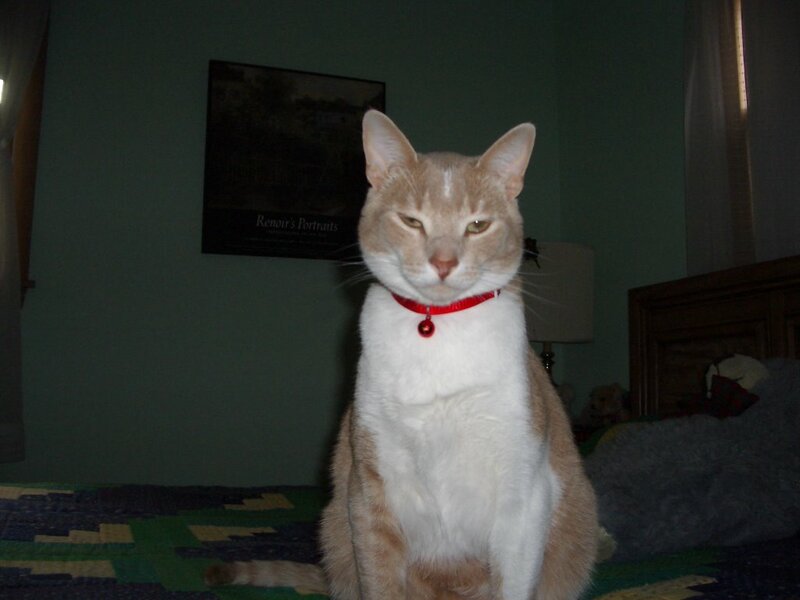 The collar has been missing since early Sunday, so nearly a whole week. But lately she hasn't really been looking for it. Maybe she figures it is gone for good. Hee, hee, maybe I have finally ditched it for good. Mum is yawning like it is time to go to bed. Far to early for that, at least for me. We need to play, that should wake her up. 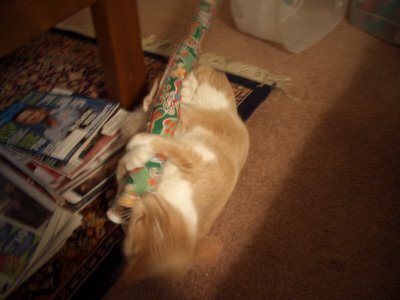 Me, helping mum wrap presents. I am doing pretty good. Plus the paper had pictures of little kitties and bears on it. 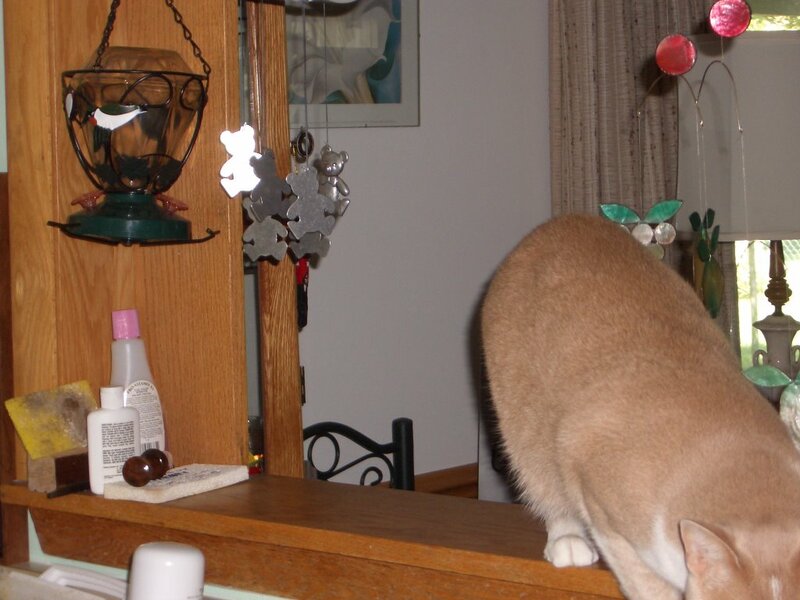 Oh, no mum still has not found the collar, hee, hee, hee. Well mum brought home a box. But she got out all of the presents she bought and wrapped them in bright papers. Then she putted them in the box and taped it shut. So I can't get into it at all. Bummer. But I don't think any of this stuff had my name on it. When am I going to get my stuff?? So finally mum is done with all of the presents and turned on the 'puter. This way I can catch up with all of my fellow bloggers. Seems like most everyone is going through the same thing with trees, decorations, visitors, presents. So it is hectic for all of us. 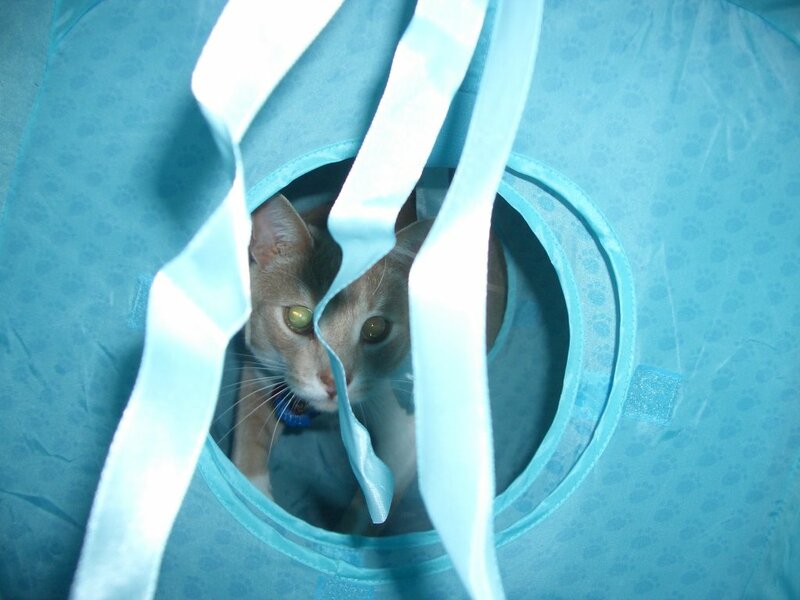 I managed to sneak into the big cold box. Yes, inside. Mum was looking for something and made enough room for me to get in on a lower shelf. But mum pulled me back out right away. OK, still no collar. Maybe because mum gets up before it gets light out and comes home in the dark too. The trees are safe, mum put one on a small table that only has room for the tree. The bigger one mum put a big book on the bottom so it is not likely to get pushed over. A big package arrived today, but mum says that is Grampie's Christmas present from Stormie. What! it's not for me?!! The naughty or nice meter today. NICE. Thanks to all of you for your nice words on the picture on my last post. Mum takes good pictures and I happened to hold still and pose a bit. Kukka-Maria, mum is surprised that you thing I am a hot dude. Wow a teen idol up on someone's wall. Never thought it would happen. 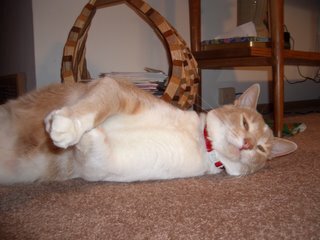 Mum is still looking for the collar, hee, hee, she goes by it many times a day but just isn't seeing it, at least not yet. She will probably find it next time she gets out the big sucking machine. Roscoe and Opus, if you guys are homesick, get your mum to read from some of the websites from your old home. Check out the sports on espn.com or from an online newspaper from Indy. Yes, I have to be careful of the trees. I was trying to chew on the majic tree and it didn't agree with my tummy. Mum came home and found a small whoopsie with some of the plastic from the tree. 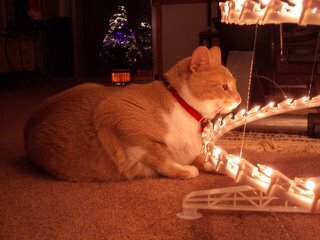 Mum calls it fiber optic strands. So now that tree is up on a small table. I have to figure out how to get at it now. The big tree, well it tips easily so it doesn't take much to knock it over. But I knocked it over last night just after mum went to bed. She came out and set it upright. I haven't done anything else with it yet. Just biding my time. I am cuddled up next to mum and putting the moves on her. I need more treats and lovin'. Oos, I gotted carried away and had all four legs wrapped around her arm and bit her on the arm. So I gotted banished from the couch for now. Better go grovel. I want more treats. Mum still is looking for my collar. No it is not in the litterbox. Mum cleans that real good and anything the size of my collar would stand out. I think she likes it as I make noise when I move and I can't sneak up on her. Well deary, that's the point. I do want to surprise you. Plus she had made a tag with my name on it, so I know she wants to find it really bad. 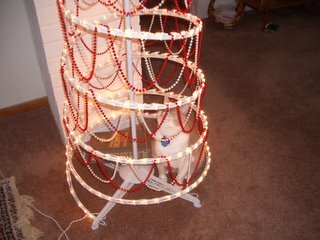 Oh, and I knocked the Christmas tree over early this morning. Mum wasn't very upset, almost like she expected it. Nothing broken. Guess I gotta try harder. Hee, hee. I like sitting by it and whapping at the beads she has on it. Then there is another little tree that changes color by majic. It is all sparkly and it isn't that big, not that much bigger than me. Hee, hee, hee. I got out of my collar again. The best bit is that mum hasn't been able to find it. She keeps walking around the house asking "Derby, where did you leave your collar?" Does she think I am going to tell her? Or show her? It is in a really great spot...hmmm. Maybe I better not even tell you guys, she might read this. Mum has also been getting out more lights and beads and snowmen and more stuff. So everything is moved around. The beads are fun but most of them are out of my reach. Edsel, don't worry. Santa and Christmas come even if your mum doesn't decorate. 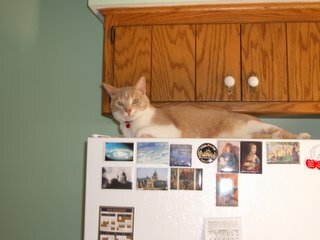 To anser a question from Sanjee on getting on top of the 'frig. I can't jump directly from floor to the top. First I get to the counter, then from there to the 'frig. And no the big sucking machine did not get me. Mum always checks to see where I am when she starts it and gives me a chance to get out of the room. Diva Kitty says she gets put in the tub of death if she does this. DK, what is the tub of death? Mum's friend Jane came to visit and see me for the first time. She is a nice lady and she brung a present for me. THANKS. Mum putted the present away for "later". Anyway I gotted extra scritches from her and mum showed her how to feed me a treat. Mum says she has either a kitty or doggy living with her. I smelled doggie on her, but might be getting a new kitty as well. Oh, a Christmas kitty. Then they tooked off for a long time. Again coming home with packages that got putted away before I could check them out. They got home late as the snow made the driving poorly, but everyone got home safely. Mum says we might get 3 inches of snow. Some of the Christmas stuff is coming out. So things are changing around here. More stuff to check out. Mum says the weather, all the driving in the bad weather and getting the Christmas stuff out has made her tired. We need to get to bed early tonight. What do you mean "we" kemosabi? 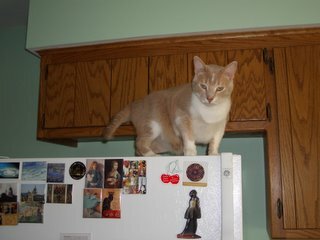 Edsel wanted to know how it is up on top of the big cold box. I like it. First, I am up higher than mum, so I could jump on her head if I wanted to. Second, I can see all of the cooking stuff, but am out of the way and can't get stepped on. It is easy for me to get up here. 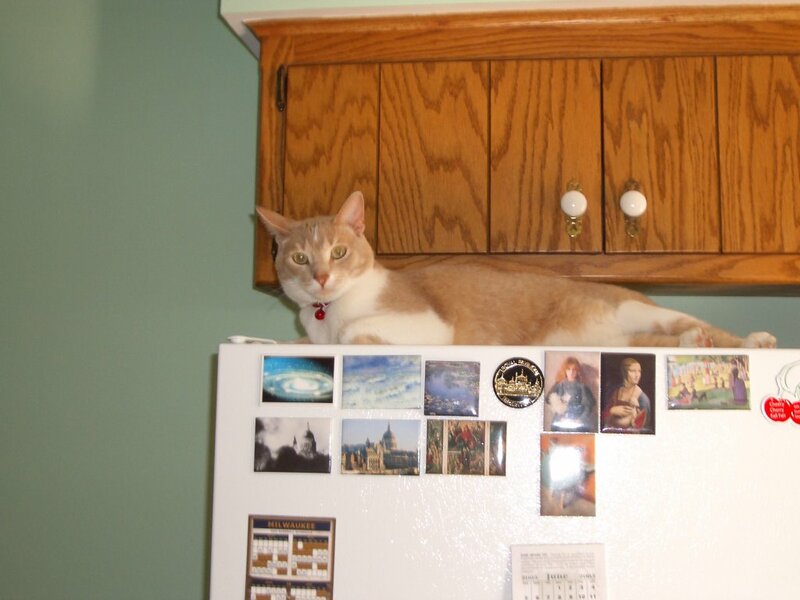 I jump to the counter top and then to the top of the 'frig. 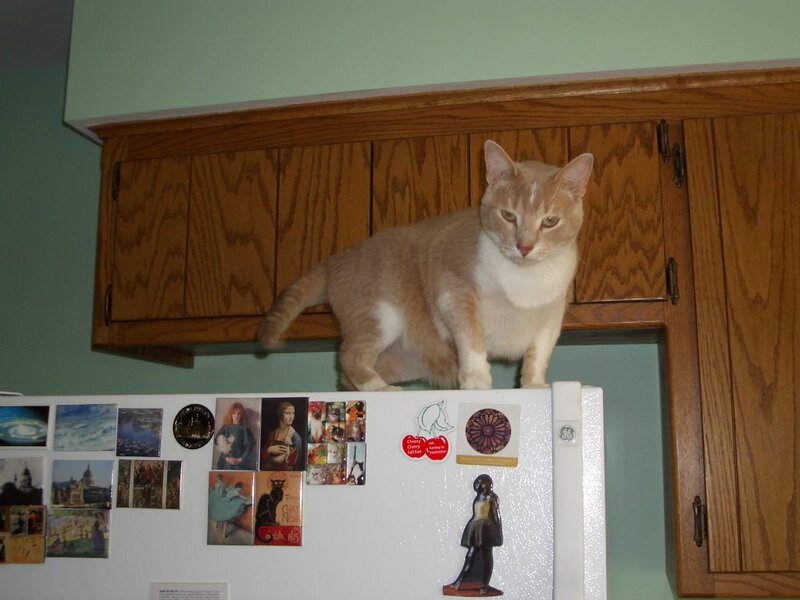 Here you can see me getting ready to jump to the top of the 'frig. Sometimes I jump on the table, to the window, walk to the counter, then jump. I had mum use her flashy box to show you my path. Mum says some kitties might not have a kitchen where they have such an easy way to get to the top of the box. Oh, mum is getting that big sucking machine out. Time to make myself scarce for a while. I forgotted to say welcome back home to Emily. She is a cat from Appleton, Wisconsin, who went exploring, ended up in a box that got shipped to FRANCE. Mum says that is way across the ocean, even farther away than Charlie and Pandora. But not as far away as Opus and Roscoe.The trip over in the ship took three weeks. Anyway, today, she came home to her family on a first class plane trip home. Wow, what an adventure! I don't think Emily has a blog, if she did what a story she would have to tell us. Mum came home late with packages that got put away before I could check them out. Hmmm... are they for me? Is mum helping out Santy Claws? Them mum keeps putting me out of the kitchen. She says I will get burned on what she calls peanut brittle. The only part I like is the butter. So I am keeping watch on her from the top of the big cold box. Oh, better go, mum is starting a new batch. Time for me to see if I can be more help. She says to thank you all for the good words. She says she is a tough old bird (I thought she was a humum) and a little bug won't keep her down for long. So tonight we are spending some quiet time together. Cuddle and snuggle time. Mum says another early night as well. She needs her beauty sleep. Mum, you are bee-ute-i-ful, no matter how much or little sleep you get. I love you. PURRRRRR. Not the good bugs either. Mum came home early and wented to bed. She said her tummy was feeling poorly. So I have to go and check up on her. See if she needs anything. Dr. Derby to the rescue. On the couch by mum when she is reading. What ever mum is listening to, plus listening to the birdies sing outside when the windows are open. The cat bungee as mum call it. A feather and bell on a stretchy string that gets stuck high up for me to jump at. After gettin’ some this week. TURKEY. Real Turkey. 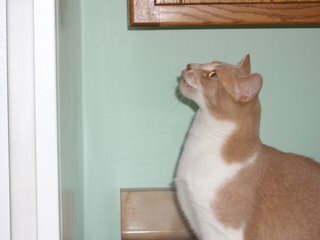 The big windows that come all the way to the floor, I can see lots of birdies there. Favourite naughty thing to do? 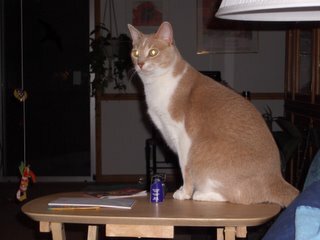 Knocking things to the floor from the table or counters. So I tag, Oreo, TimothyDickens, Buzzerbee & Meep, WmMD and Boni. Whew. This tag is hard work. Time for a nap. At least it is a yucky day. All of our snow has melted, we got rained on and foggy. 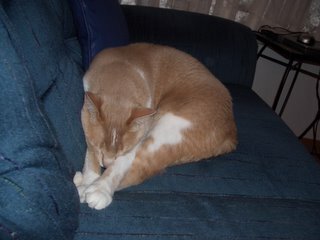 So it has been a wonderful day to curl up on the couch and snooze. 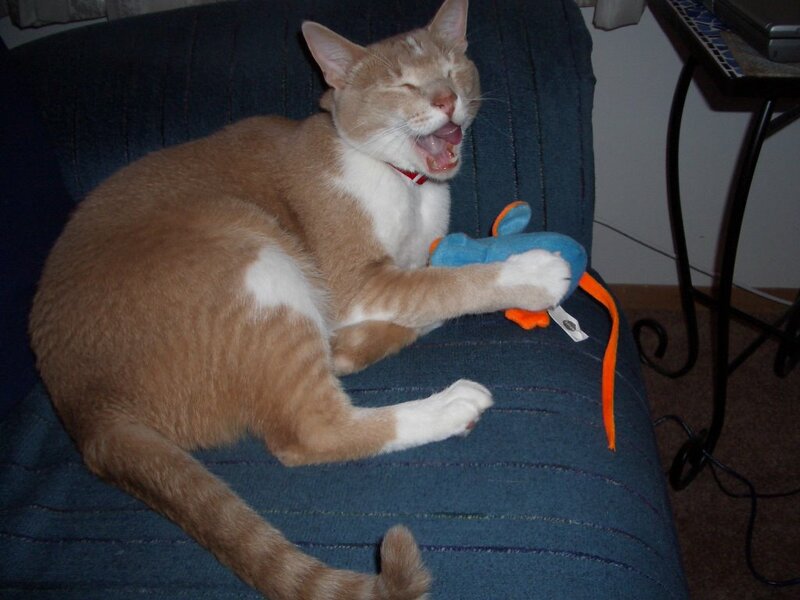 I have just been curled up on the couch with my mousie. Mum is working on stuff so she is ready to go back to work tomorrow. She cooked some earlier, she gave me a very tiny taste of hamburger. Not bad, so she can give me more of this in the future. She is very careful on what she feeds me. As she tells me, it is her food not mine. But she will share if I don't beg. Opus and Roscoe, mum says she will cheer for Idnia, no, India, hmm, Indianap, .... the Colts on tv tomorrow. Mum says "Da Bears" won again and the Packers play in a little bit. 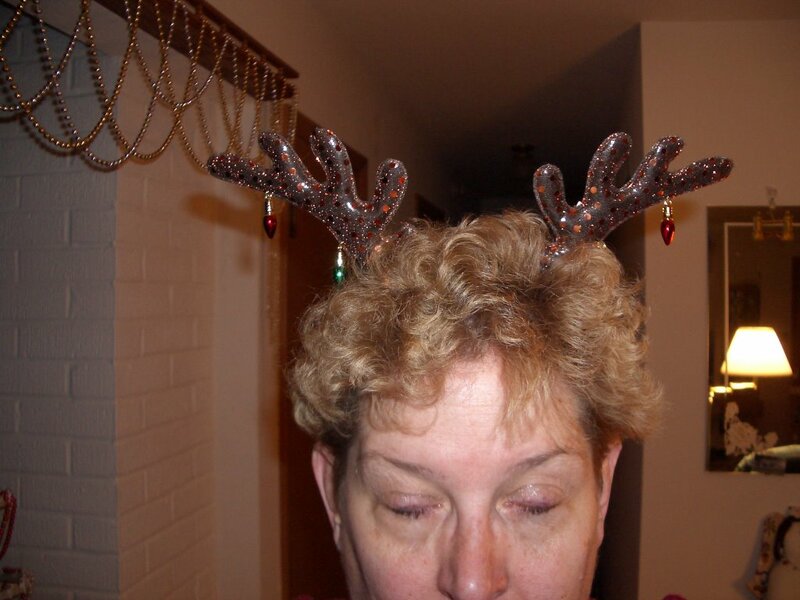 Mum said she talked to the peoples next door, they went hunting and got eight deers. She says that is good. Mum talked to some other neighbors and found out they have a girl kitty. But she only stays in the house, so not the one who visited last week. 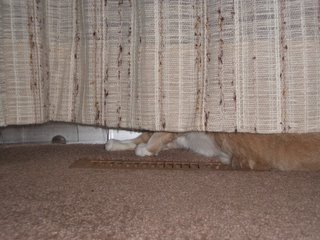 We still haven't figured out where that kitty lives, but we haven't seen it since. Oh yeah, I forgotted to post my ansers to Charlie's tag game. Favourite flavour of Stinky Goodness? You mean I can only pick one? Mum’s bedroom window, I can see the birdies from there and jump on mum’s feet as she lays in bed. Run after mum and pounce on her feet. Whoops, I was just trying to catch the mouse cord to get control of the 'puter when I slid off the couch. With no claws I slowly slipped to the floor. Short trip so no damage. Mum doled out some more turkey tonight for me, with enough left for another day. She says I eat turkey faster than I eat tuna. Well, I don't get it as often. And mum doesn't feed me enough to make me sleepy, Oreo. Matter of fact I was just chasing around some of my toys, the blue mousie, a jingle ball and the inside cardboard from the toilet paper. It snowed yesterday, mum says we got about 3 inches. She moved the snow off the driveway and brought some in for me. It's cold and wet, what would I want to do with this stuff? 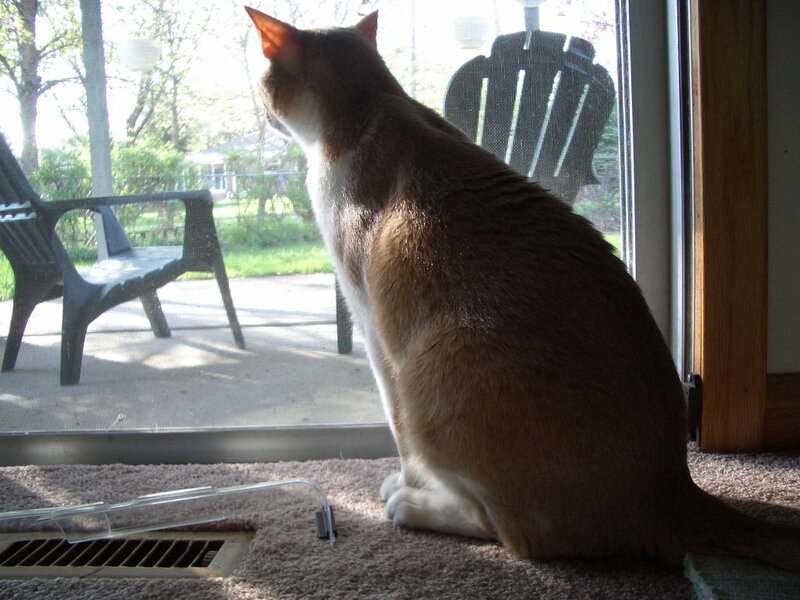 I am an indoor cat, keep the outside stuff outside. OK, mum is done with the dinner dishes, time to act like I wasn't using the 'puter. Mum and I took it easy today. We sat by the big window and watched the birds, and I saw the hawk today. He landed in the crabapple tree, sat for a few minute and then flew off. Mum says it is a sharp-shinned hawk. It was also just starting to snow. So it is very pretty out. Mum gave me a little bit more turkey today, nothing more as the dressing has onjuns in it. Mum says kitties are not supposed to eat onjuns as they are bad for us. I also bugged mum and she updated all of the links to the rest of the gangs blogs. I hope she didn't miss anyone. I guess I better check that. OK, supper is done, time for my early evening nap, then bug mum to play with me. Hmmm, mum left early. 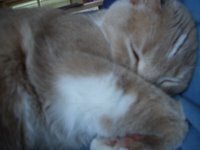 Nothing to do but nap and dream of turkey, turkey, turkey turkey, turkey, turkey, turkey . . . . . . . . . . . . . . . . . . . . . . . . . . . . . . . z z z z z z z z z z z z z z z z z z z z z z z z z z z z z z z z z z z z z z z z z z z z z z z z z z z z z z z z z z z z z z z z z z z z z z z z z z. Huh, I'm awake. Wait, mum is home and yes, she scored. TURKEY ! ! ! ! ! ! ! ! ! ! ! ! ! ! ! ! ! ! ! ! ! ! ! Enough she says for me to have a little bit for a couple of days. I luv my mum, she comes through with the good stuff. Hope all of my furry friends out there had a good day. Hope you got your favorite treats today. Mum got as good a picture as she could with me and the colorful lights. 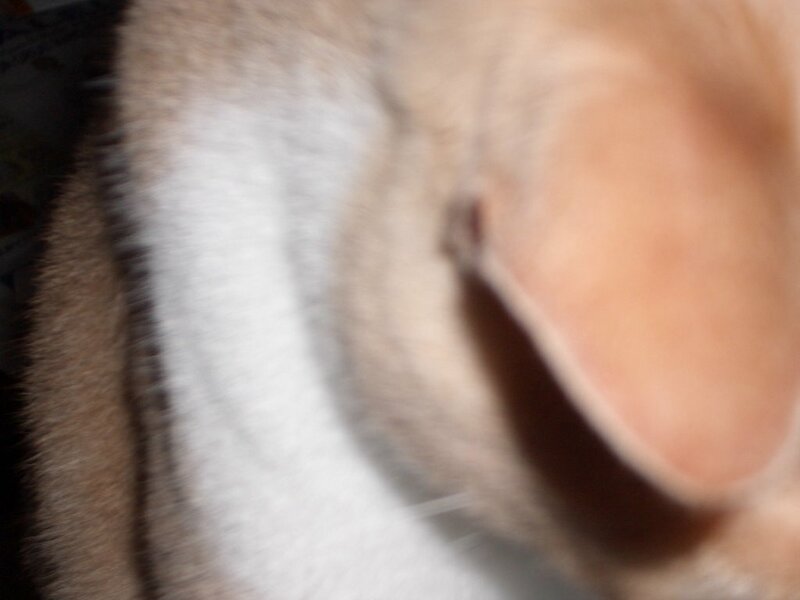 I didn't want to hold still for long, so I am a little blurry. I also refused to really pose well. 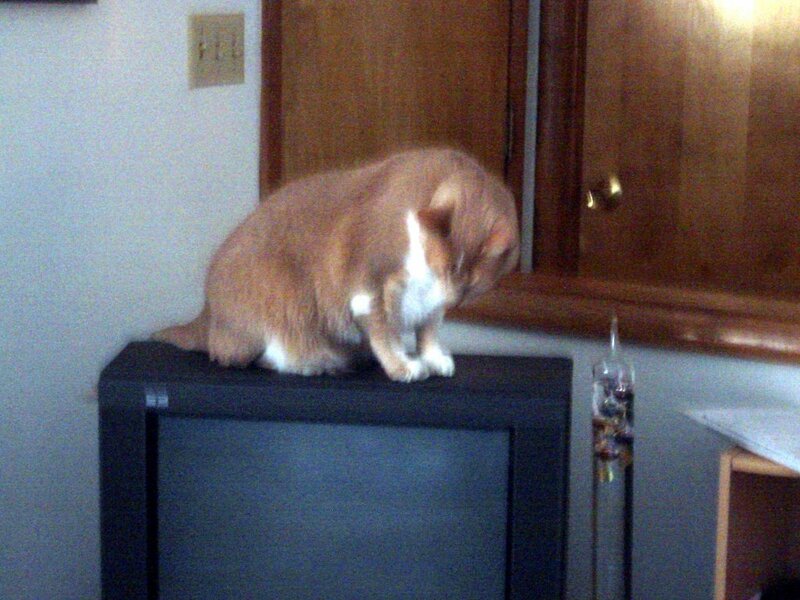 Mum tried to bribe me with a treat, but then I jumped off the TV to eat it. We got a small amount of snow today. Makes the birdies easier to see outside. Mum and I counted over a dozen at one time on the 'kitty TV' feeders. Mum has stayed home today but was working in the dungeon. I gotted put out of the room again and the door is shut so I can't check on what she was doing. She said I has to stay out or I would be the color of regal oak. Mummy has promised me turkey even though she is not cooking the dinner. Boy have I got her trained. To all, Happy Thanksgiving. Safe traveling. For someone who is on vacation and not going to work, Mum seems to be busy. She left and came back home three different times. Each time with packages that got put away before I even got a chance to check any of them out. Mum says these are special things for later. How much later? The good thing that when mum comes home I get my typical welcome home routine. So three batches of ear and chin scritches. I like that. Yes, my mum has a screen saver of me! You can do this too with any picture that is JPG format. All you need is the screen saver program which you can get for free. Mum got hers from secondnature.com. Mum says there is a show on the pets left homeless by hurricane Katrina. Guess that is what we will be watching. This will be better than watching sports, even mum got tired of football last night and went to bed. Mum has finally finished with the 'puter so I can do my thing. I was trying to help her print out Grampie's Christmas letter and such. But mum wanted me totally out of the way, so I gotted picked up, and put outside the room and then mum closed the door. Oh, and mum didn't go to work today. Seems she has vacation this week. She did work hard today anyway. More outside work to make the outside of the house purrty. Plus she went to the human stabby place today, just a checkup. But she used to work at a human stabby place and did the stabbing. AHHH. She says she gave it up, so I have nothing to worry about. Mum thinks the kitty we saw the other night belongs to someone who lives nearby. They don't keep their kitties inside all the time. So she hopes the kitty went home to get warm and has an outside spot to stay warm. Mum needs to get ready for the football game tonight. Monday Night Football with the Packers, they get to play outisde in the cold. Brrrrrrr. Mum and me got spooked out by a kitty last night. It jumped up on the outside of the front window. I jumped and then mum got up to look outside. 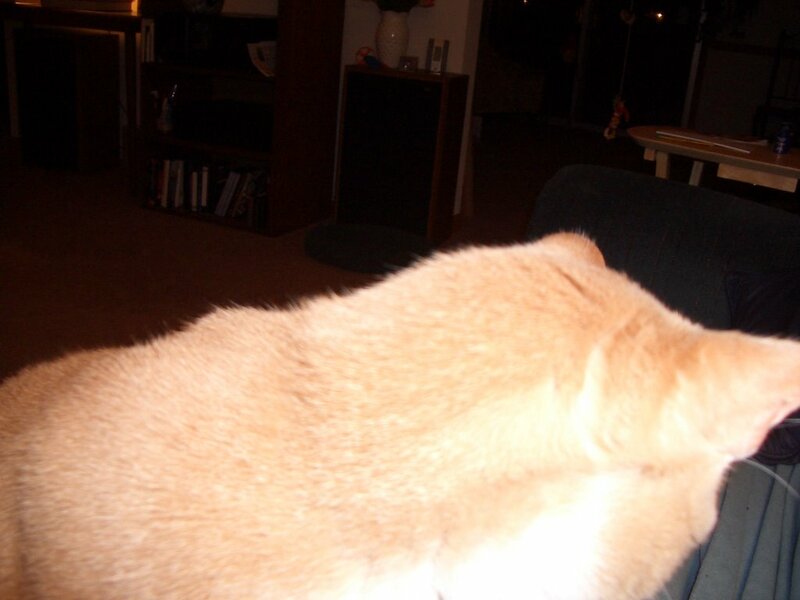 She turned on the light to see if she could help the cold kitty but he runned away. It looked alot like either Opus or Roscoe. But mum says they live to far away to drop by for a visit. Today mum went on the roof of the house. She is very brave to do that. Grampie comes over to hold the ladder. Mummy got her big blowee machine out and cleaned the roof of all of the leaves. So the outside of the house looks very pretty. The neighbor lady put some sparkly lights in her windows today. Makes the sleepy room bright, so not sure if mum will like it at night. Mum says they will not be on all night. When Grampie was here he kept telling me to go in the closet. Mum kept telling him that she wants me to stay out of the closet. So I just left them alone and napped on mum's bed with the teddy bear. Well mum didn't have to go to work today, so I didn't get stuck in the closet. Mum didn't even go anywhere today. But mum rechecked the boots and made sure I hadn't left any presents. 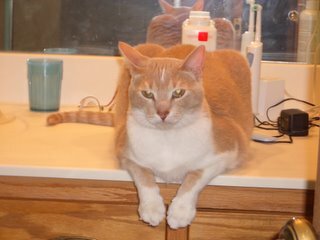 Shaggy wanted to know what I used for a litter box. But I had just used my real one. So with no breakfast I really didn't need to do anything. I have feeling that mum will be a little extra careful on this in the future. But I forgive her as I know she loves me. To show her I had no hard feelings I snuggled up on the bed with her this morning. I didn't even wake her up early. We had a nice day. Mum cleaned and then we sat at the big windows and watched the birdies. Well at least I did. Mum readed her magazines and a book. Mum is getting my flyer toy out. She pulls a string and a little helicopter thingy flys off. I like to try and catch it. So gotta' go and play. It is a good night, I've got mum on a guilt trip. She left for work this morning and didn't see that I was in the closet. So I spent the whole day shut in. I spent most of the day napping. Not much else to do. I did dig up a bit of the carpet egde but mum didn't seem to be upset by this. So when she came home I was not at the door to greet her. But I let out a meow and she found me real fast. So since she felt so bad about shutting me in all day, I got some special treats. TUNA, cheese and chicken. I have to try sneaking in there more often if this is what I get. YUM. Mum got home early, seems the 'puters at work didn't work right. So we already have our feet up for a lazy evening. And keeping warm together. But mum warned me she has to have a call tonight with the other side of the earth, with people from Korea and Singapore. Wow, any kitties out their from these places? Mum got out her winter coat today, mittens and earmuffs. To bad hu-mums don't come with a nice fur coat like us cats. 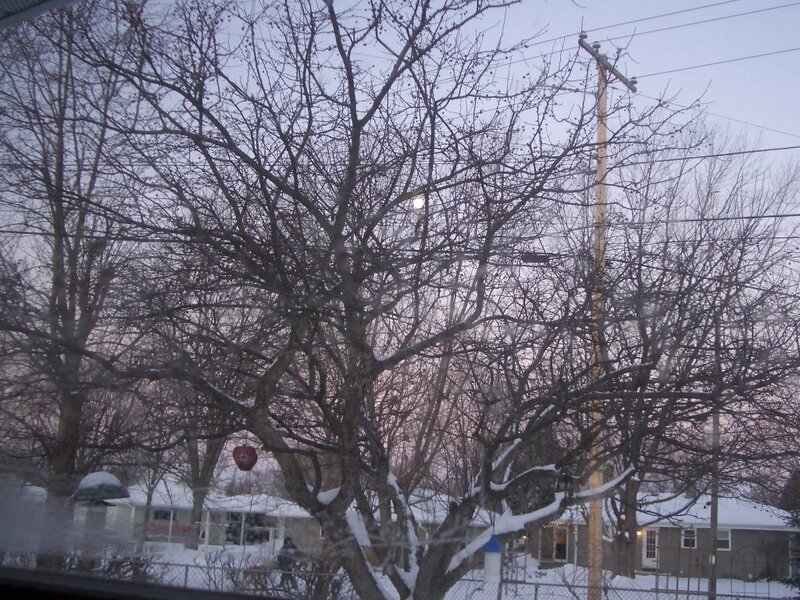 Although I will take my winter looking at it through the window. Not like Shaggy who likes going outside in this weather. But we don't even have snow on the ground yet. I managed to get mum to take off my new collar. Houdini strikes again. Saturday a string was loose and I got a tooth caught. Mum managed to get that off without problem. But tonight I was working at trying to get if off and got my tags caught in my mouth. So to keep me safe mum took it off. Seems the length slipped so I could get this in my mouth. I am hoping she will give up trying to make me wear a collar. She wants me to wear a a collar so I make noise and can't sneak up on her. But that is the most fun. Extra cuddles, sandpaper kisses and purrayers to my mum's friend Barb. Barb's mum passed away yesterday.